On his remarks at Orlando in Florida, Principal Deputy Assistant Secretary Thomas P. Kelly for Bureau of Political-Military Affairs said piracy off the coast of Somalia is a critical issue for the United States, the international community, and the global economy. He cites that since 2008, Somali pirates have hijacked 175 vessels and attacked at least 445 others. Somali pirates have kidnapped 3,000 crewmembers from over 40 countries, and are still holding 241 hostages today, he added. According to Mr. Kelly, Somali pirates hijacked 27 ships last year and six already this year. While piracy at sea is certainly not a new problem, its modern reincarnation has new impacts, he noted. In a globalized world, the impact of piracy in one area of the world can cause a ripple effect across the globe, he stressed. He says people in countries around the world depend on secure and reliable shipping lanes for their food, their medicine, their energy, and consumer goods brought by cargo ships and tankers. By preying on commercial ships in one of the world’s busiest shipping lanes, pirates off the Horn of Africa threaten more than just individual ships, he stated. He states that a vicious and reinforcing cycle was forming. Motivated by escalating ransom payments which grew into the millions of dollars and a lack of other opportunities to make money quickly, more and more Somali men took to the sea, Mr Kelly cited. He stresses that piracy went from a fairly ad hoc, disorganized endeavor to a highly developed transnational criminal enterprise. He adds that to make matters worse, Somalia offered pirates near ideal conditions. He notes that with more than two thousand miles of coast line and with the Gulf of Aden to its north, Somalia sits along one of the world’s busiest shipping lanes. He reports that over time, tankers and other high-value ships became prized targets for potential high ransoms that raised the bar on the amounts demanded by and paid to pirates for individual ships and crews. The fact that many tankers are ‘low and slow’ makes them particularly attractive targets, he added. He underscores that piracy emanating from Somalia represented a perfect storm for the international community, a weak state in a strategically essential location that harbors a rapidly growing transnational criminal enterprise and which threatens a vital artery of the global economy. Mr. Kelly stresses that the U.S. government has made it clear that it will take all appropriate measures to protect citizens, safely recover hostages, and bring hostage takers to justice. In the past, there seemed to be no limit to the growth of piracy, he stressed. In 2011, the number of “successful” pirate attacks fell by nearly half, he reported. In addition, there has been a significant drop in the numbers of ships and crew held hostage. In January 2011, pirates held 31 ships and 710 hostages. In early May of 2012, pirates hold ten ships and 241 hostages, a roughly 70 percent decline, he cuted. U.S. and international naval forces have thwarted pirate attacks in progress, engaged pirate skiffs and mother-ships, and successfully taken back hijacked ships during opposed boardings. The world has sought to deter piracy, through effective apprehension, prosecution and incarceration of pirates and their supporters and financiers. Today, over 1,000 pirates are in custody in some 20 countries around the world, many of whom have been convicted and sentenced to lengthy prison terms. 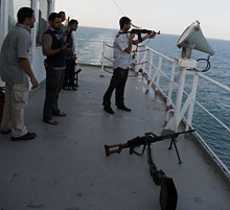 The US government has also sought to rally the wider international community to address the problem posed by piracy.